For Chef Itsara, like with most Thais, this is more than a cuisine, it’s a lifelong passion. It is a food love affair with deep social roots which ties us to a country’s culture and most importantly to family. Thai food is all about balance and it takes a well trained palate to get it just right. With his doctorate in plant science Chef Itsara understands his ingredients. They must be fresh all the time and authentic in every dish. 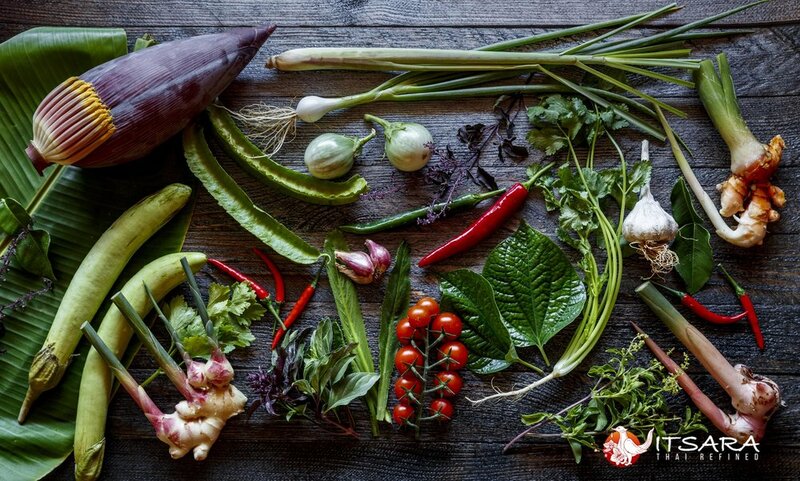 To ensure the ingredients quality and authenticity we grow vegetables and herbs at our farm in the Swan Valley. Every day, Chef Itsara spends the morning in the garden where he tends to the next crop of veges, like Holy Thai basil, lemongrass, chili or apple eggplant which will then be served right onto your plate. To complete the circle, food scraps from the restaurant are returned to the farm to nourish the chickens and ducks. Hand making sauces, pastes and growing vegetables is only part of the path to amazing Thai, quality rice is a fundamental foundation to great Thai food, so we use only the best long-grain Thai Jasmine Rice imported from Thailand. Thai food has long been influenced by neighbouring countries, their culinary cultures and visitors to the Kingdom. Dishes from Thailand’s central region have hints of Indian and Persian flavours, while northern cuisine from around Chiang Mai province takes inspiration from neighbouring regions of Southern China. Southern Thai cuisine has a distinct Muslim flavour while Thailand’s northeast region (Isan) produces fiery and pungent dishes that are very much Laotian in character. Chef Itsara and his team humbly welcome you dine at our table and enjoy the best of Thailand. If you are looking for your favourite go to dishes or seeking something new your are sure to be delighted with our menu. As our talented chefs make everything to order we can easily cater for your dietary requirements and are a well known gluten free restaurant. Talk to our friendly staff as they greet you warmly into the land of smiles. Recently we have been awarded as a Premium Thai Select restaurant. The Thai SELECT program recognising and celebrating authentic Thai restaurants around the world. It is a great honour for us to receive this recognition from the wider Thai community. Since opening our doors in 2009, Itsara’s diners get enjoy our authentic Thai cuisine, and our valued, loyal guests have welcomed us into their community with a wonderful following.